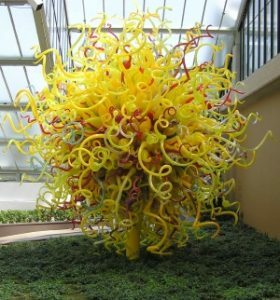 A number of magnificent glass sculptures from the world-renowned glass art studio of Dale Chihuly will be displayed through October 7 at the historic Biltmore Gardens in Asheville, NC. The exhibition is open during the day and also in the evening with nighttime shows featuring dramatic lighting to enhance the wonder of Chihuly’s unique glass art. This is the first time that glass art of any kind has been displayed in the Biltmore estate’s gorgeous gardens and and this promises to be an unforgettable experience! If you’re in the area during this time we highly recommend attending this exhibition as Chihuly works are truly one of a kind. You can read more about this wonderful exhibit here and tickets can be purchased here.